Light painting is an incredibly fun technique in which photographers use flashlights, camera flashes, and spotlights to literally paint light into a scene. It's one of the most fun night photography techniques. Many photographers have attempted it, but only a few have mastered it (and I'm admittedly NOT one who has mastered it). Nevertheless, I want to share a few things that I have learned while trying out light painting. #1. Don't try to paint everything with the same light. It will look really odd and flat. Would a painter use only one brush? Neither should you! The whole purpose of light painting is to create different and unique lights on each different part of the landscape. #2. Choose a dimmable flashlight with an adjustable beam for best results. Many flashlights have adjustable beams, such as Mag-lights, but few flashlights can be dimmed so that you can use just the right amount of light on every part of the photo. 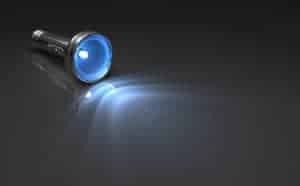 I'm eying this dimming flashlight on Amazon. #3. Be careful with noise. Taking your pretty little time painting in light is convenient, but long exposures also create more noise. For more tips on reducing noise in your night photography, check out this post. #4. You'll need to take more than one photo. In fact, some light paintings, like the incredible light paintings featured in the video below, require dozens of photos so that each part of the photo can be treated separately. #5. Choose a flashlight that doesn't have a hot spot. As long as you move the flashlight around enough, it won't make a difference if the flashlight has a bright circle in the middle of the beam, but for doing little fine details in the scene, you'll want without a hot spot. A cheap DIY option for removing the hot spot is to tape wax paper or tissue paper over the flashlight lens. #6. If you don't have a dimmable flashlight like I mentioned before, you can create a snoot out of a cereal box. It actually works quite nicely and nobody will be able to see your ghetto photo gear since it's dark outside. If you want to look fancy, then buy this snoot on Amazon.com. #7. Just because you're light painting doesn't mean you should forget all your typical night photography techniques. Remember to use mirror lockup, long exposure noise reduction, a cable release, etc. #8. Make sure to mix in ambient light to make the photo look more natural. For example, include the moon, street lights, etc. This adds a lot to the mood of a photo. #10. It's okay to focus each picture on the specific area you're working on. This will improve the sharpness in the overall shot. Just make sure to get one wide-angle shot of the scene so you can put all the little pieces together. For some light painting photography inspiration, check out this incredible video made by Eric William Curry. Some day I'll be that good… some day.